It’s all too easy to give your pets snacks between meals – they are so appealing, after all – but according to animal charity PDSA, more than a third of British dogs are already overweight, and this proportion could rise to 50% by 2013. The charity has been highlighting the dangers of over-feeding pets in recent months, with slimming competitions for tubby tabbies and corpulent canines encouraging pet owners to do something about the situation. So, what are the dangers to overweight animals – and how can owners help pets whose paunches have become a problem? The simple case is that – like humans – pets which are overweight have a reduced quality of life. They are likely to be less sprightly generally and less keen to exercise – in short, they are going to be less fun. But in addition to this, they are also likely to suffer from a range of conditions linked to their obesity. Again, as with humans, this can include heart disease, diabetes, respiratory problems, high blood pressure and even cancer. The RSPCA calls obesity “an extremely serious welfare issue”, highlighting that it causes a large amount of unnecessary suffering to pets. Ultimately, it can lead to reduced life expectancy. Obesity can be a result of disease, and there are also a variety of factors that can have a bearing on weight for both cats and dogs. For example, some breeds are more prone to obesity than others, while being neutered and the ageing process also increases the risk. However, a more common reason than any of these is that a pet is getting more energy from its food than it is using up in exercising; either it’s eating too much, or not being active enough. With cats and dogs, you should be able to feel the ribs – though they should not be sticking out – and the animal should have a waist which is visible from above, along with a belly which is tucked up when viewed from the side. If it does not have these features then it may be overweight, or even obese, depending on the scale of the problem, and it could make sense to contact your vet. 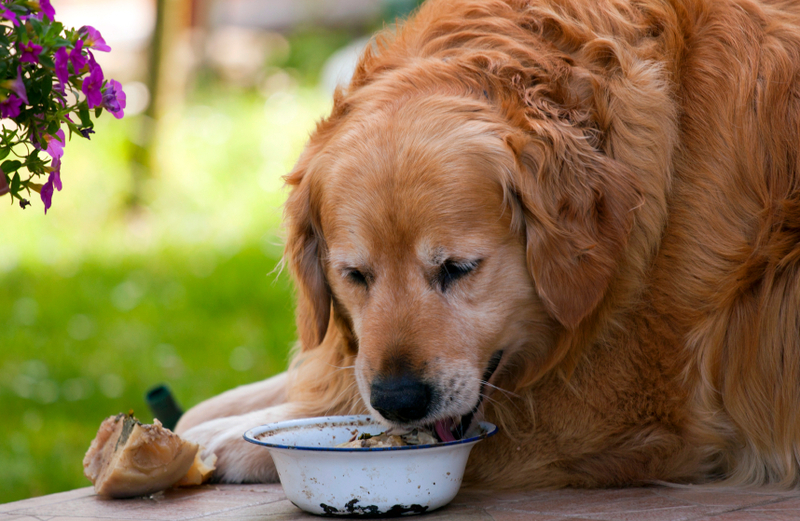 It is suggested that owners feed their animals commercial pet food – as recommended by a vet – as opposed to providing a home-made diet, as pet foods make it easier to gauge the level of nutrients they are getting. Try to follow the guidelines on the packaging so you don’t under- or over-feed. While giving treats can work well in training to reward good behaviour, owners should try to avoid sugary or salty food – in fact, the PDSA suggests that most dogs like chopped carrot. The other part of the equation is ensuring that your pet gets plenty of exercise. In addition to taking a dog for walks – and allowing it to run off the lead in safe, contained areas – there are a number of ways to encourage it to take exercise. Playing ‘fetch’ with a tennis ball or even a Frisbee is a common example, while allowing your dog to swim is a good option for animals with joint problems. If you are up to it and if you have a dog which is calm enough, you could even try a ‘springer’ – a fixed lead with a built-in spring – which allows you to cycle safely alongside your pet. Cats – particularly those which spend their time indoors – may also need to be encouraged to play, with owners setting aside time to interact with them. In addition, a cat which has a relatively soft life can be encouraged to ‘work’ for their food by using toys which release food when they are pushed around. Ultimately, a slim pet is likely to be healthier than an overweight one. Something to bear in mind too is that pet insurance is available to cover health conditions. Overweight dogs die earlier than fit, healthy dogs of the correct weight. Take control of your dog’s weight and have a happier, healthier dog for longer.